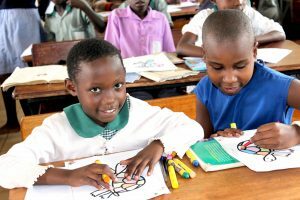 Meeting Point International through a project with AVSI Foundation, Support International and Insieme Si Puo’ has created a program that links Ugandan children with private donors who provide educational and other activities support. For contributions click here. The women assisted by MPI, taking part of this experience, wanted to give the same education they are receiving from MPI to their own children. 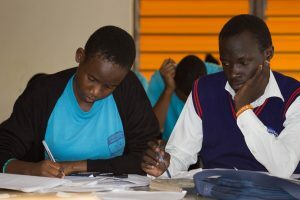 Two schools were born from this desire, thanks to AVSI and CESAL: the Luigi Giussani Pre-Primary and Primary School, attended by 450 children, in the district of Kireka, and Luigi Giussani High School, attended by 537 students in Kamuli road. In Kireka (Acholi Quarters) since 2004 MPI has implemented a Day Care Centre for children who were unguarded during working hours. With time it was found necessary to continue with a Primary School, not only because of the natural growth of the children, but mainly to give continuity to the educative methodology started with the Day Care Centre. The LUIGI GIUSSANI PRE-PRIMARY AND PRIMARY SCHOOL has been built in the very centre of the slum on Kireka and it aims at giving a chance to the least of the last. It is already in use for Nursery,P1- P7 classes and this year 280 pupils are regularly attending the lessons. Luigi Giussani High School in Kampala, Uganda celebrated its inauguration February 3, 2012: A high school for 400 boys and girls from Kireka, made possible thanks to 48,000 necklaces made of colorful recycled paper by the women of Meeting Point International and sold by over 1,300 volunteers of AVSI Point, a network of supporters, at booths, involving entire companies as well as single colleagues, family and friends. A sign of a friendship that is beyond all borders and which continues to grow. “The project of the Luigi Giussani High School was started because we wanted the kids, like the adults, to understand their true value. Our intention was therefore to see if our experience could educate, and so we wanted that what began with their mothers, who have discovered the value of their lives, could continue in the children as well”. 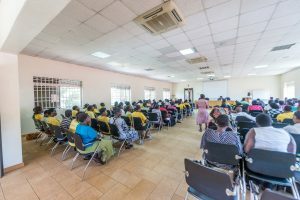 Rose Busingye, the founder of Meeting Point International in Kampala, Uganda, says this about the Luigi Giussani High School, a new secondary school built in the capital of Uganda, in the district of Kireka, which will open on February 3. “The mothers participated and are helping even now, even doing strenuous manual labor. Our intention was precisely to create this wonderful place for companionship and belonging to ensure that these children can discover themselves,” Rose says. Luigi Giussani Institute of Higher Education (LGIHE) is a non-profit organisation that was founded from the experience of Meeting Point International and Fondazione AVSI, an international, non-profit, non-governmental organization established in Italy in 1972. LGIHE focuses on promoting professional growth among educators through training’s, workshops, seminars, and community dialogue with civic leaders.